Sorry for the newb question, but after a serious 3 hour Googling session have not been able to answer this question by myself. 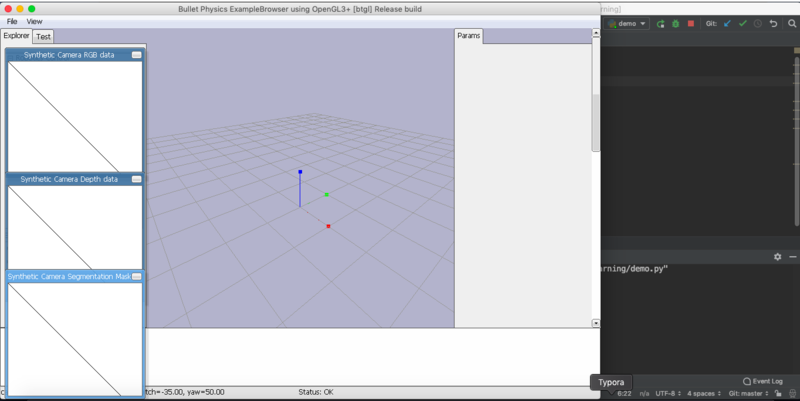 Am currently experiencing issues getting PyBullet to render meshes in the example browser. Have been following the quickstart guides code from page 3. Copy/pasted it into Pycharm. Last edited by paulscon on Sun Feb 24, 2019 10:12 am, edited 1 time in total. My understanding is that I should see R2D2 just chilling there- if that is not correct? When I run your script, it shows the R2D2 indeed, on the ground plane. With the camera panning from left to right. -Containerising Pybullet - learnt from your Github post this is not currently possible! 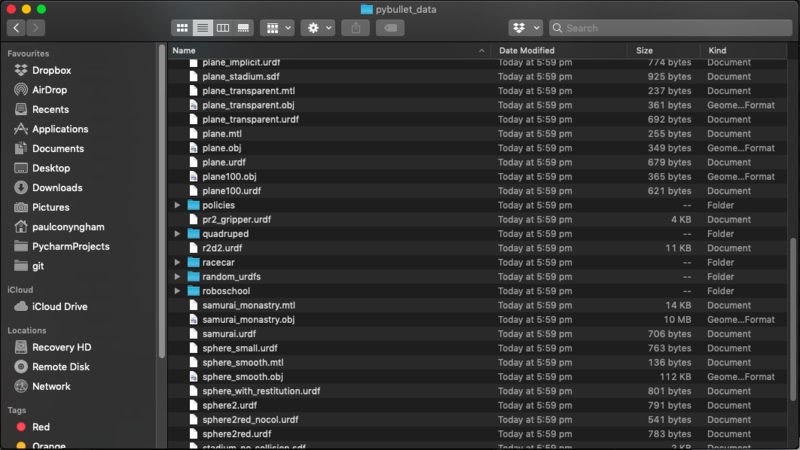 -Created a conda virtual env running python 3.6 on OS X Mojave, including all the relevant packages to run pybullet. Unfortunately no luck here either! 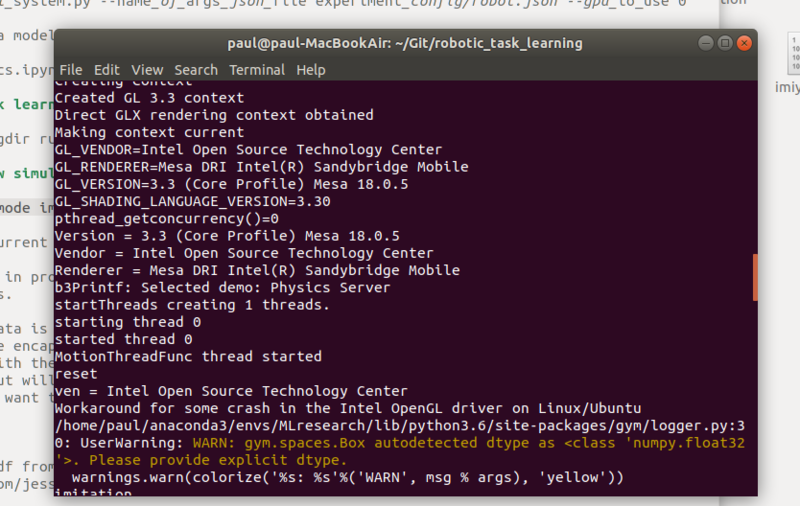 -Dual booted into Ubuntu 18, installed Pybullet (on a python 3.6 env) and it worked perfectly! Thinking it might be some kind of OS x mojave issue. Not smart enough to solve this I am afraid! Going to continue development in Ubuntu & appreciate your help mate! Last edited by paulscon on Wed Feb 27, 2019 4:58 am, edited 2 times in total. As a quick question, might there be someway to turn off hardware acceleration (If this is currently the case) as thinking this might have something to do with it? just posting this here for anyone else that experiences the issue. The workaround for me at least was to run it on Ubuntu on my mac in dual boot.